This rabbit hutch with outdoor enclosed rabbit run and built in ramp ensures optimal opportunities for your pet rabbit to exercise. 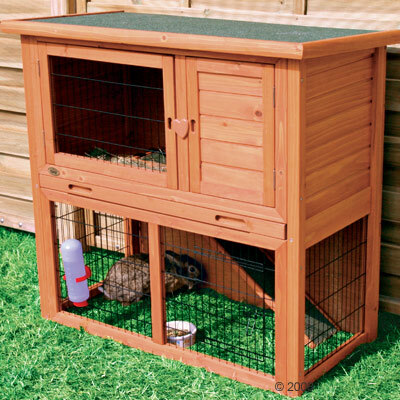 The rabbit hutch also has an indoor space which can be used as an escape for sleeping or quiet time for your rabbit. The roof can be opened completely so that the hutch can be cleaned simply and efficiently. Additionally there is a wood door on the front of the cage and in the lower run there is also a cage door. The pine is treated with a special stain and similarly the roof is specially coated. This makes the rabbit hutch waterproof and suitable for use in winter. L 104 x W 57 x H 97 cm. Size of roof including hinges 104 cm x 57 cm. Size of the wood door 27 x 36.5 cm. Height of the hutch (above) 45 cm. Height of the outdoor enclosure (below) 38 cm.